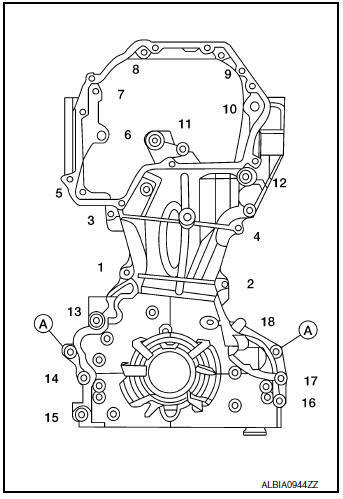 CAUTION: Apply new engine oil to parts as indicated in the illustration before installation. Remove the engine and transaxle assembly. Refer to EM-81, "Exploded View". Remove intake manifold. Refer to EM-26, "Removal and Installation". Remove the drive plate assembly. Refer to EM-92, "Exploded View". Install engine to a suitable engine stand. Refer to EM-91, "Setting". 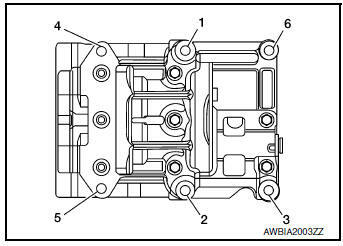 Disconnect harness connector from intake valve timing intermediate lock control solenoid valve. Disconnect harness connector from intake valve timing control solenoid valve. Disconnect harness connector from exhaust valve timing control solenoid valve. Remove valve timing control cover. Remove the upper and lower oil pan, oil strainer, and O-ring. Refer to EM-32, "Removal and Installation". Remove generator. Refer to CHG-20, "Removal and Installation". 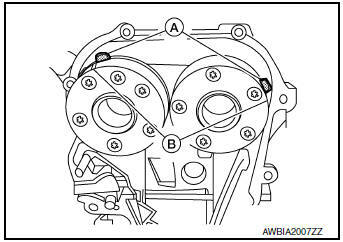 Rotate the crankshaft pulley clockwise and align the mating mark (B) to the timing indicator (A) on the front cover. NOTE: Do not use the white paint marks (C). 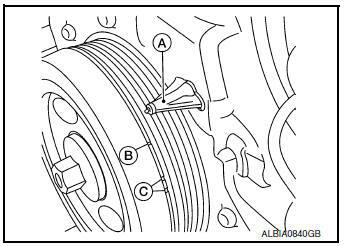 At the same time, make sure that the camshaft sprocket mating marks (B) line up with the painted marks on the timing chain (A). 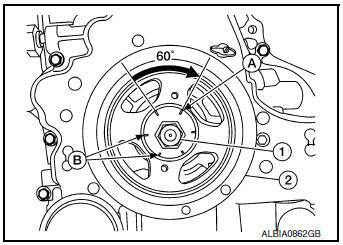 If not lined up, rotate the crankshaft pulley one more turn to line up the mating marks to the positions as shown. NOTE: Shown with front cover removed for illustration purposes only. 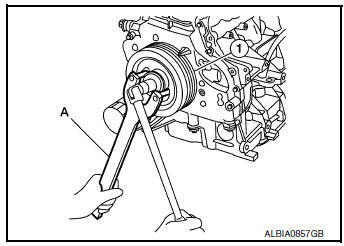 Hold the crankshaft pulley (1) using suitable tool (A), then loosen and remove the crankshaft pulley bolt. 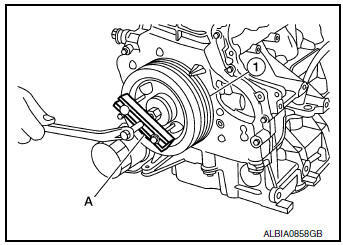 Attach suitable tool (A) in the M 6 (0.24 in diameter) thread hole on crankshaft pulley (1), and remove crankshaft pulley. Remove the intake valve timing control cover. Refer to EM-75, "Valve Timing Control Cover". Loosen the bolts in reverse order as shown, and remove them. Cut liquid gasket using Tool (A). CAUTION: Be careful not to damage the front cover. Remove front oil seal using suitable tool, (if necessary). Pull the lever (B) down and release the plunger stopper tab (C). Plunger stopper tab (C) can be pushed up to release (coaxial structure with lever (B)). Insert the stopper pin (A) into the tensioner body hole to hold the lever (B) and keep tab released. NOTE: Allen wrench [2.5 mm (0.098)] is used for a stopper pin as an example. 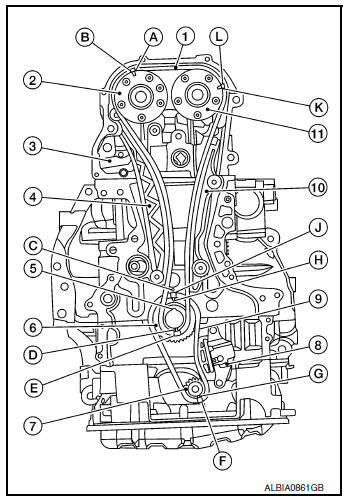 Insert plunger (C) into tensioner body by pressing timing chain slack guide (1). Keep timing chain slack (1) guide pressed and hold it by pushing the stopper pin (B) through the lever hole and body hole. Remove the chain tensioner bolts (A) and chain tensioner. CAUTION: Do not rotate the crankshaft or camshafts while the timing chain is removed. It can cause damage to the valves and pistons. Secure hexagonal part of the camshaft with a wrench and loosen the camshaft sprocket bolt. Remove the camshaft sprocket bolt and camshaft sprockets for both camshafts. Remove the timing chain slack guide, timing chain tension guide, and oil pump drive spacer. 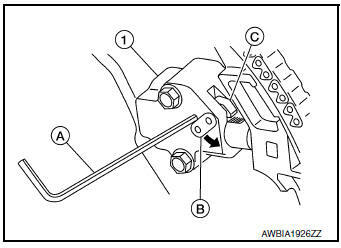 Press stopper tab (A) in the direction shown to push the timing chain slack guide (B) toward timing chain tensioner (1) for the balancer unit. 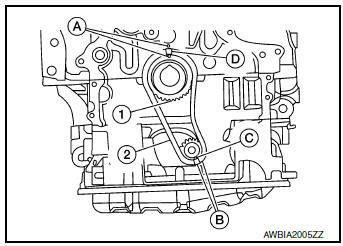 The timing chain slack guide (B) is released by pressing the stopper tab (A). 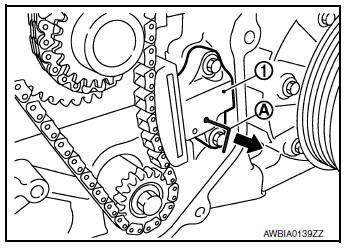 As a result, the timing chain slack guide (B) can be moved. 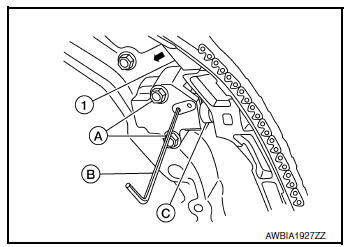 Insert stopper pin (D) into tensioner body hole (C) to secure timing chain slack guide (B). NOTE: Use a hard metal pin with a diameter of approximately 1.2 mm (0.047 in) as a stopper pin. 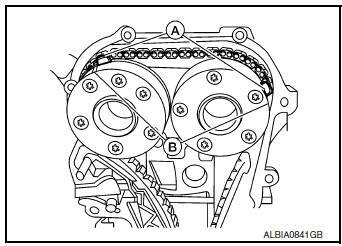 Remove timing chain tensioner (1) for balancer unit. Secure width across flats of the balancer unit LH side shaft using a suitable tool. Loosen the balancer unit sprocket bolt. 22. Remove balancer unit timing chain, balancer unit sprocket and crankshaft sprocket. Loosen bolts in the reverse order shown, and remove balancer unit. Do not disassemble balancer unit. 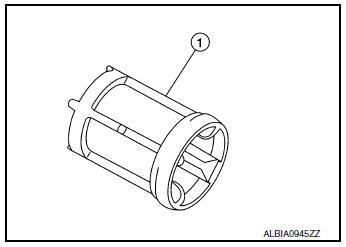 Check that there is no foreign material on the oil filter (1) and check for clogging. Check the oil filter for damage. If there is damage, replace the oil filter. Do not reuse oil filter. 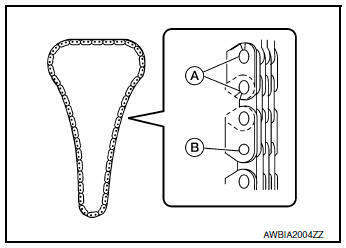 Check the timing chain for cracks (A) or excessive wear (B). If a defect is found, replace the timing chain. Measure outer diameters (d1, d2) at the two positions as shown. Measure d2 within the range (A). 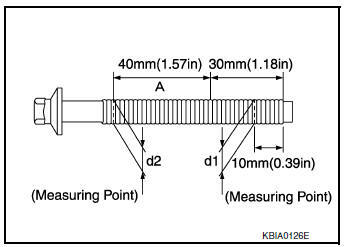 If the value difference (d1 - d2) exceeds the limit, replace the balancer unit bolt with a new one. Make sure the crankshaft key points straight up. When reusing a bolt, check its outer diameter before installation. Follow the Balancer Unit Bolt Outer Diameter procedure. Apply new engine oil to threads and seating surfaces of bolts. Check tightening angle with an angle wrench (A) or a protractor. Do not make judgment by visual check alone. Install the crankshaft sprocket (1) and timing chain (2) for the balancer unit. Make sure that the crankshaft sprocket (1) is positioned with mating marks (A) on the block and sprocket meeting at the top. 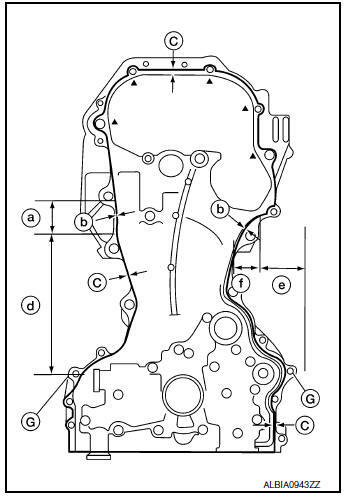 Install it by lining up mating marks on each sprocket (A), (C) and timing chain (B), (D). 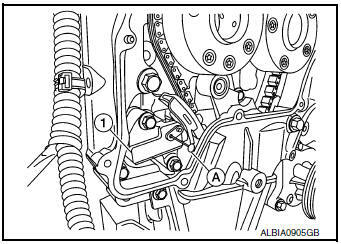 Install timing chain tensioner for balancer unit (1). Compress the plunger, insert a stopper pin (A), and then install the tensioner for the balancer unit. Do not pull out ( ) the stopper pin until after installing the timing chain tensioner for balancer unit. Check matching mark position of balancer unit drive chain and each sprocket again. Install them by lining up the mating marks on each camshaft sprocket (B) with the ones painted on the timing chain (A) during removal. Before installation of chain tensioner, it is possible to re-match the marks on timing chain with the ones on each sprocket. Aligned mating marks could slip. Therefore, after matching them, hold the timing chain in place by hand. Before and after installing chain tensioner, check again to make sure that mating marks have not slipped. 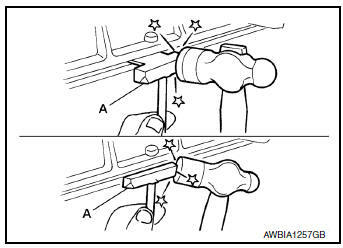 Install stopper pin (A) into the chain tensioner (1). Install the chain tensioner and pull the stopper pin out. CAUTION: After installation, pull the stopper pin out, and make sure that the tensioner is fully released. 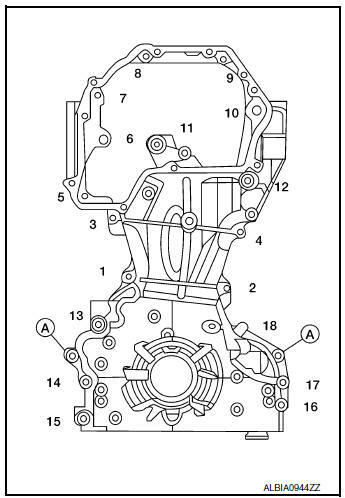 Install timing chain (1) and related parts. Install by lining up mating marks on each sprocket and timing chain as shown. Before and after installing chain tensioner (3), check to make sure the mating marks have not slipped. 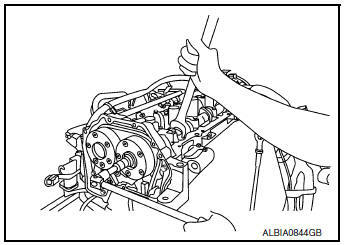 After installing timing chain tensioner (3), remove the stopper pin, and make sure that the tensioner moves freely. For the following note, after the mating marks are aligned, keep them aligned by holding them by hand. To avoid skipped teeth, do not move crankshaft and camshaft until front cover is installed. Before installing chain tensioner (3) it is possible to slip the chain on the sprocket to align the chain timing mark with the sprocket timing mark. There may be two color variations of the link marks (link colors) on the timing chain. There are 26 links between the pink mating marks on the timing chain; and 64 links between the camshaft sprocket pink link and the crankshaft sprocket yellow link, on the timing chain side without the tensioner. Install new front oil seal to front cover. 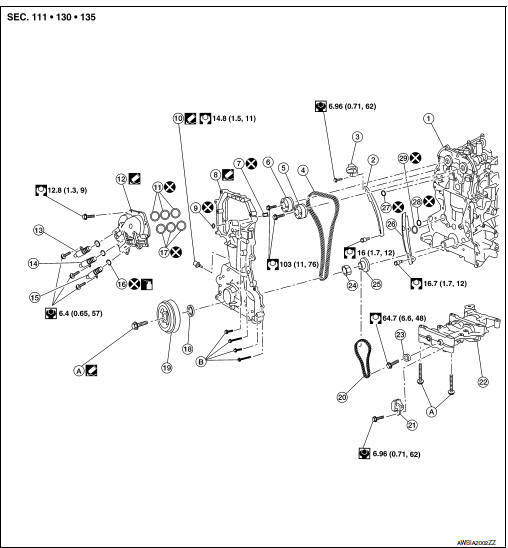 Refer to EM-78, "FRONT OIL SEAL : Removal and Installation". Install O-rings to cylinder head and cylinder block. CAUTION: Do not reuse O-rings. Apply a continuous bead of liquid gasket to front cover as shown. Use Genuine RTV Silicone Sealant or equivalent. Refer to GI-22, "Recommended Chemical Products and Sealants". Be sure sealant surfaces are free from grease, dirt, water, and engine oil. Be sure to apply sealant without breaks or overlap. Installation should be done within 5 minutes after application of liquid gasket. Do not fill the engine with engine oil for at least 30 minutes after the components are installed to allow the liquid gasket to cure. Make sure the mating marks on the timing chain and each sprocket are still aligned. Then install the front cover. CAUTION: Do not damage the front oil seal during installation. Tighten front cover bolts in the numerical order shown. After all bolts are tightened, retighten them to the specified torque. CAUTION: Wipe off excess sealant leaking at the surface for installing the oil pan. Install the chain guide between the camshaft sprockets. Install valve timing control cover. Refer to EM-75, "Valve Timing Control Cover". Insert crankshaft pulley by aligning with crankshaft key. Tap its center with a plastic hammer to insert. Do not hit belt mounting section with hammer to avoid breaking belt guide. Be sure not to damage front oil seal while installing crankshaft pulley. 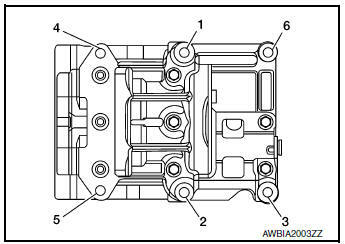 Install crankshaft pulley bolt (1) and tighten to specification. Apply anti-corrosive engine oil to threads of crankshaft pulley bolt (1) and bolt bearing surface prior to installation. Secure crankshaft pulley (2) with suitable tool to tighten the bolt. Apply a paint mark (A) on the front cover, mating with any one of six easy to recognize stamp marks on bolt flange (B). Installation of the remaining components is in the reverse order of removal.